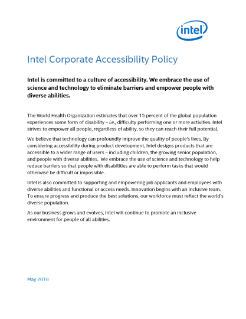 Intel is committed to a culture of accessibility. By considering accessibility during product development, Intel designs products that are accessible to a wider range of users – including children, the growing senior population, and people with diverse abilities. We embrace the use of science and technology to help reduce barriers so that people with disabilities are able to perform tasks that ...would otherwise be difficult or impossible.